Live in a home that fits your way of life when you purchase flooring that is designed to withstand the scrapes and spills that come with an active family. When you visit The Flooring Pros, Inc. before any remodeling project, you get design assistance and an assurance of quality in everything we do. Our selection of luxury vinyl planks in Charlotte, NC, is hard to match. We separate ourselves from other flooring stores with a combination of focused design assistance and superior installation. You deserve a new floor that looks great for years to come. Every client that we serve has differing needs, so we give them the latitude they need with price protection guarantees and installation warranties. We take the time to ask in-depth questions about each room so that we understand your expectations for the home going forward. While some are interested in increasing the value of their home on the market, others require a way to reinvigorate their existing living space. While vinyl tiles crafted to match the appearance of stone go great in places like the upstairs bathroom, many appreciate the traditional appearance of vinyl planks designed to look like various species of wood. Each flooring product performs well in different settings, so having a flooring professional invested in your project makes a great deal of sense. Our designers consider your entire home when suggesting a vinyl product for a particular room. 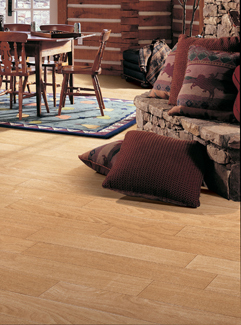 Laminate floors are great for high-traffic areas on upper floors. When you decide that you want to continue the appearance of wood flooring into places like bathrooms and kitchens, the right choice is vinyl plank. A luxury vinyl plank floor is resistant to moisture and spills, provided they are installed and sealed by an experienced contractor. Luxury vinyl planks (LVP) are an excellent choice for many existing homes because they match the plank style of most hardwood products in other rooms. Our selection gives you a higher degree of flexibility when it comes to installation on upper floors. Start living in the home of your dreams that much quicker when you hire the right group for luxury vinyl plank floor installation. Planks made of vinyl won’t expand and contract to the degree that traditional hardwood does, so there are no expansion joints needed. You won’t be derailed by subfloor imperfections either when you decorate with vinyl plank. Learn more about the advantages that come with an LVP floor, and start living in the home of your dreams right away. Cover every floor with products from our expansive flooring store, and give your home a new lease on life. Contact us today to expand the reach of your design plan with luxury vinyl planks. We proudly serve customers in Charlotte, Matthews, Pineville, Sun City, Waxhaw, North Carolina, and the surrounding communities.